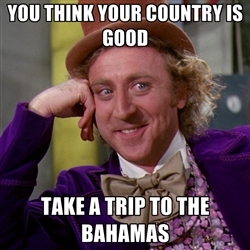 Despite being less than an hour away by plane from Florida and having millions of tourists grace our shores annually, The Bahamas is still a third world country. I don’t think we like to admit that to ourselves sometimes because our outward appearance is like that of any other person you might see in the U.S. We wear the Ralph Lauren, the Aeropostale and the like and our homes and equipped with the modern kitchen appliances. But we still depend on the U.S. to import many of our foods and even fruits that we could very well grow here. The first step is to admitting that we have a problem. We are dependent on the U.S. for so much and that’s kind of sad because if things go to crap because of war or the U.S. messes up their alliances with an oil-supplying country, we’re going to feel that bruise just as much. No matter how much we try to keep up with the United States’ technologies and the rest of the materialistic junk, it won’t change the fact that we as a country although “independent” since 1973, can’t stand on our own two feet if our lives depended on it and each generation that comes up will be wiser but weaker. They will be hip to all that’s new and shiny but would frown up their noses at real oranges because they aren’t all sweet nor are they all that fake bright color. Anywho, I just thought readers should know that yes we are a third world country, a very proud one at that. So don’t go asking us if we have inside toilets and live in straw huts and what not. You won’t get a pleasant response. But in truth, 95% of what is in our food stores comes from “the States”.